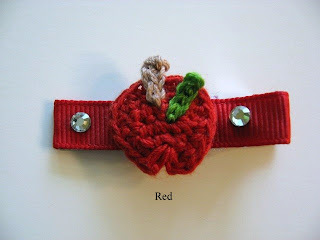 Recently, LadybugsNButterflies Fine Boutique Children's Hair Accessories contacted me to review a few items for them. They sent me some gorgeous hair accessories for my daughter! 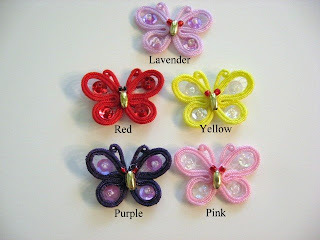 Some of my favorite hair bows that they carry are the Mariel Joy, an adorable corded butterfly that comes in the colors in the photo above! I also love the Alexis Calli, a super cute petite Apple Handset with Genuine Swarovski Rhinestones! The thing that I like best about LadybugsNButterflies is that you can get any of their hairclips for girls in any of the following styles: 1 3/4" Alligator Pinch Clip, 1 1/2" Toddler Snappy Clip, 1 1/4" Infant Snappy Clip, 2" French Barrette, Big Girl Pony O or Toddler Pony O! Not to mention that the prices are incredibly affordable, something that I LOVE! I also love the Daisy Lynn (pictured above) because Daisys are one of my favorite flowers! 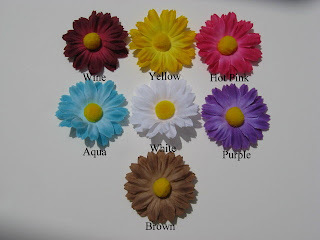 These little hair clips are so cute and are available in so many different colors! There are so many different styles and colors on LadybugsNButterflies' site, anyone will be able to find something to suit their fancy! I'm in love with LadybugsNButterflies hair clips and I'm so glad I was able to pick the different type of clip for my picky child! She doesn't do anything with her hair often so the versatility was definitely a positive! LadybugsNButterflies would like to give one lucky A Simple Kinda Life reader their very own clips for their little girl! If you are chosen as the lucky winner, you can choose TWO clips! To enter, just head to LadybugsNButterflies and have a look around. Then come back here and tell me which clip and style you like the most! This giveaway will end on March 20th, 2010, at noon EST. Winner will be notified via email so please leave your email address in your comment! I will also post the winner's name in a post here. Thanks to LadybugsNButterflies for reaching out to me and thank you for entering! I like the Amanda Jo infant snappy clip. I love the Madison Kay Headband. Entered Win and give giveaway!